Former Hamas Interior Minister promises to annihilate and destroy the Jews who build "settlements" around Al-Aqsa. An official in Hamas recently vowed to annihilate the “brothers of apes and pigs” - that is, the Jews. 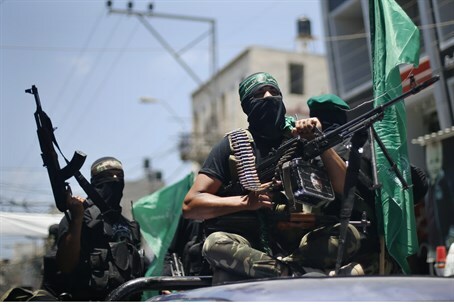 The comments by former Hamas Interior Minister Fathi Hammad aired on the Al-Jazeera Network on October 31 and were translated by the Middle East Media Research Institute (MEMRI). “We say to the brothers of apes and pigs: No matter how much you destroy, dig, and try to build settlements around the Al-Aqsa Mosque, we are coming to uproot you, to annihilate you, and to destroy you,” he threatened. “The hypocrites will find themselves in the lowest level of Hellfire. Whoever shackles his people and their resistance, whoever shackles the AK-47s, will be trampled under the feet of our people in this world, and will find himself in the lowest level of Hellfire in the world to come,” added Hammad. Hammad has in the past called on Fatah to join Hamas and “wage Jihad” against Israel. He previously declared that Israel will be gone in eight years. Other Muslim leaders who have in the past compared Jews to apes and pigs include Palestinian Authority Mufti Sheikh Muhammad Hussein and former Egyptian President Mohammed Morsi.